I spotted this cheerful garage door along a laneway called Croft St that I have toured many times. I think this would be a nice door to come home to after a busy day! ...thanks for cheering up me day! P.s. Hopefully your friend in Bunbury will have some good weather while here. Hope they get a chance to get up to Perth. It's been a while since I've been down to Bunbury, I believe there's some incredible street art there these days. Love that garage door, very cheerful. Oh yes, I like this one very much. How do abstract artists put just the right shapes and colors together to create such an eye catching scene? It is a colorful mural. Enjoy your day and new week ahead! It's very nice and very colorful but I have one problem. Notice how the painting goes over the door and blends in with the actual structure. Well, let's say I'm coming home from having my eyes dilated...it might be difficult to see where the building ends and the door begins and I'd probably take down the whole garage! ;) Well, hey, it's something to think about....right? Would love to come home to this, brightens up even a dull day! I like this idea of garage doors with murals. Regarding your comment at today's post, hopefully your visitors are up tomorrow or Wednesday here. We're getting some of the same heat you're getting this week, and that'll do a number and pretty much finish the tulips off. I haven't been down to Dow's Lake since a week ago today, but assume there are still some there. I have been around Major's Hill Park, the War Memorial, and Confederation Park yesterday, and there were still active tulip beds. 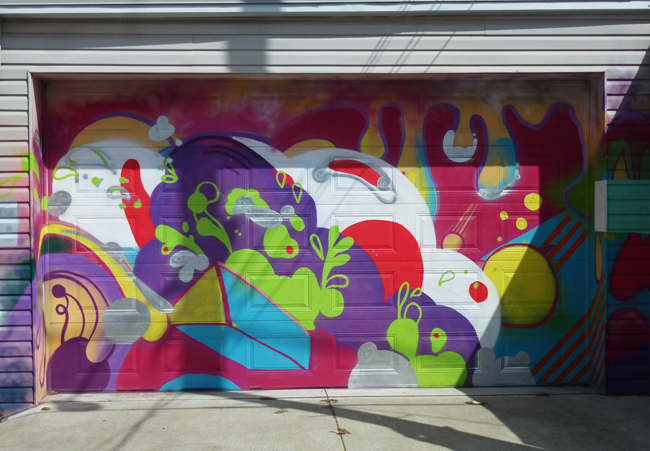 That is an amazingly colorful mural on that garage door. Great find. I don't know what the artist intention was but it made me think of fruit and cheese right away! I like these garage doors, Pat ! It certainly brightened my day!